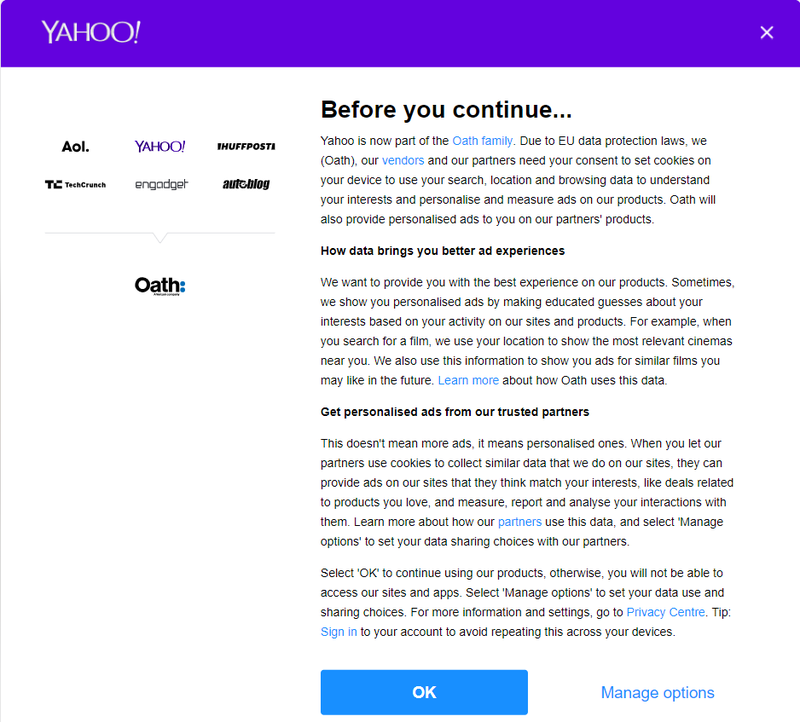 Yahoo!, HuffPost and TechCrunch, all of which are part of the umbrella company Oath Inc., have begun serving consent request to users of their platforms in attempts to comply with the EU’s GDPR, which comes into force on 25th May. Other organizations, including Forbes.com, have also begun serving consent requests. Oath properties appear to be offering a custom solution that presents users with options to select or deselect vendors they are willing to share their data with. The message in the consent request reads, “our vendors and our partners need your consent to set cookies on your device to use your search, location and browsing data to understand your interests and personalise and measure ads on our products”. It also appears to leverage the Interactive Advertising Bureau’s Transparency and Consent Framework, which standardizes consent requests across the advertising supply chain. The ‘other partners’ tab on the consent management platform provides a list of hundreds of vendors that users can toggle on or off dependent on their preferences. Google, one of the world’s largest advertisers, hasn’t yet signed up to the IAB’s framework and trade groups representing thousands of news organizations will meet with Google executives on 24th May to discuss their concerns. According to the popover, the decisions made by users won’t come into force until 25th May. Meanwhile, Forbes has also implemented a consent platform provided by security and compliance company TrustArc. Visitors to Forbes.com from EU countries are now presented a popover with the heading “your consent is required”. The popover appears to be targeted based on IP address (no popover appears when accessing the website through a non-EU IP address) and affords users the choice of selecting any one of three options: “required cookies,” “functional cookies” and “advertising cookies”. Selecting an option leads to a lag of around 30 seconds while the platform processes the user’s input. “If you would like to return to your cookie consent preferences now, you can do so by clicking ‘SELECT PREFERENCES’ below”. Businesses across the world have been scrambling to implement new measure to comply with the GDPR, and a number of commentators believe that rigid compliance is next to impossible. According to a contribution in the New York Times by Alison Cool, a Professor of Information Science at the University of Colorado, some data scientists and data managers doubt “that absolute compliance [is] even possible”.